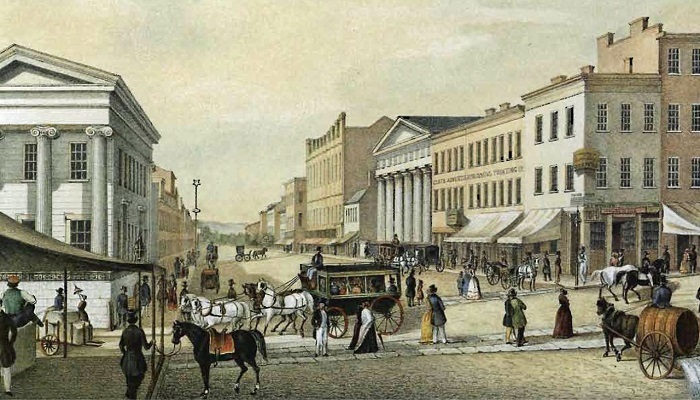 Cincinnati around 1850, when the First Universalist Society was located on Walnut Street between Third and Fourth Streets. The Stephens family name runs through the archives of our church for over 100 years. James and Elizabeth Stephens were the first members of the family to join the First Universalist Society of Cincinnati. Mrs. Stephens, then Elizabeth Guysi, was born in Philadelphia in 1822. Her parents had immigrated from England. The family set out from Philadelphia for the West when she was still a young girl. They traveled by flatboat and her father sold tin and copper utensils at stops along the way in order to pay expenses. Eventually they arrived in Cincinnati and settled here. Elizabeth was raised a Presbyterian and eventually married James Stephens. Her husband was a saddle maker by trade who had migrated to the city from Princeton, Indiana. About the time of their marriage, the couple decided to attend a revival meeting at the Wesley Chapel. At the end of the session, the Reverend John Gurley, minister of our Universalist Church, announced that he would be making his reply to the sermons at the Universalist Church on Sunday. Elizabeth and James decided to attend and thus began a lifelong commitment to liberal religion. James was an active member of the church until his death in 1885. Elizabeth and he joined the First Society when it was located on Walnut between 3rd and 4th Streets. They participated in the move to the new church on Plum Street and saw the move from there to a rented church on Peebles Corner. Elizabeth was still around to see the construction of the Essex Place church and her son Charles had a stained-glass window installed in the church in her honor. Elizabeth passed away in February of 1922, one month after her 100th birthday. Charles continued the Stephens tradition of service to our church for decades. He served in numerous positions including many terms on the Board of Trustees, as secretary of the church and as an advisor and frequent committee member. In his private life, Charles was a lawyer and founded the firm of Stephens, Lincoln and Stephens with his son, Charles Jr. In the late 1800’s, Charles was one of the leaders of a reform political movement attempting to take control of city government away from the corrupt Cox political machine. Charles ran for Vice-Mayor and lost but eventually the effort led to elections which ousted the machine from power. At a very young age, Charles was appointed to the Union Board of High Schools which oversaw public high schools in the city. In his original terms he served with Alfonso Taft, the father of William Howard Taft. He remained on that board for 72 years. He also served as a director of the Atlas Bank. At the time of his death, it was believed he was the oldest member of the Ohio Bar Association. Charles and his wife, Alice Mayhew Bard, had three sons, Charles Jr, Howard and Bard. Bard became the vice-president of a printing company but died at age 48. Howard, at the time of his father’s death, was serving as vice-president of the St. Louis Browns American League baseball team. Charles Jr. worked with his father in their law firm. Charles Stephens Sr., like his mother, lived a long life. He was still active in his law firm and his church when he suffered a cerebral embolism in 1940 and died three weeks later at the age of 99. Charles Jr. was also active in the church into the 1940’s but his name fades from active membership at that point. He died in 1961 at the age of 83, somewhat lacking the longevity of his father and grandmother. He was a lawyer for his entire adult life, teaching at the local law school for many years.